An IPMI sub-system consists of a main controller, called the baseboard management controller (BMC) and other management controllers distributed among different system modules that are referred to as satellite controllers. 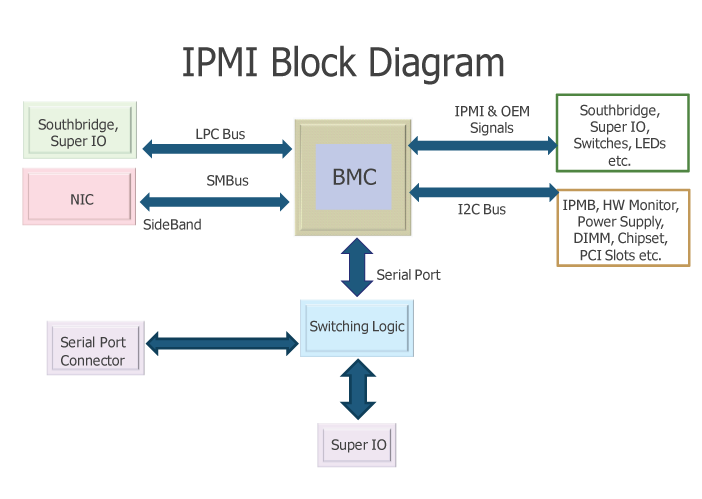 The satellite controllers within the same chassis connect to the BMC via the system interface called Intelligent Platform Management Bus/Bridge (IPMB) — an enhanced implementation of I²C (Inter-Integrated Circuit). The BMC connects to satellite controllers or another BMC in another chassis via the Intelligent Platform Management Controller (IPMC) bus or bridge. It may be managed with the Remote Management Control Protocol (RMCP), a specialized wire protocol defined by this specification. RMCP+ (a UDP-based protocol with stronger authentication than RMCP) is used for IPMI over LAN. Several vendors develop and market BMC chips. A BMC utilized for embedded applications may have limited memory and require optimized firmware code for implementation of the full IPMI functionality. Highly integrated BMCs can provide complex instructions and provide the complete out-of-band functionality of a service processor. The firmware implementing the IPMI interfaces is provided by various vendors. A field replaceable unit (FRU) holds the inventory, such as vendor ID and manufacturer, of potentially replaceable devices. A sensor data record (SDR) repository provides the properties of the individual sensors present on the board. For example, the board may contain sensors for temperature, fan speed, and voltage. The baseboard management controller (BMC) is the intelligence in the IPMI architecture. It is a specialized microcontroller embedded on the motherboardof a computer, generally a server. The BMC manages the interface between system management software and platform hardware. Different types of sensors built into the computer system report to the BMC on parameters such astemperature, cooling fan speeds, power status,operating system (OS) status, etc. The BMC monitors the sensors and can send alerts to a system administratorvia the network if any of the parameters do not stay within preset limits, indicating a potential failure of the system. The administrator can also remotely communicate with the BMC to take some corrective action such as resetting or power cycling the system to get a hung OS running again. These abilities save on the total cost of ownership of a system. Physical interfaces to the BMC include SMBus buses, an RS-232 serial console, address and data lines and an Intelligent Platform Management Bus (IPMB), that enables the BMC to accept IPMI request messages from other management controllers in the system. A direct serial connection to the BMC is not encrypted as the connection itself is secure. Connection to the BMC over LAN may or may not use encryption depending on the security concerns of the user. There are rising concerns about the general security regarding BMCs as a closed infrastructure. This entry was posted in IPMI and tagged IPMI components on 2013/10/12 by hicblog.